After getting a high bar squat PR of 500 lb last week, I figured I could probably get a front squat and low bar squat PR this week...and I did! Front squatted 350 lb on Wednesday. Felt pretty easy, so I'm thinking about jumping to 370 lb next time. My current goal is 400+ lb on the front squat. Also, I've adjusted my grip so that my fists are placed underneath my chin while holding onto straps. Feels a little bit more natural this way than having my fists in line with my shoulders while holding onto straps. My collar bones and anterior delts are still sore and tender the next day, but during the workout, it doesn't feel so bad. I am adapting. Resistance is futile. 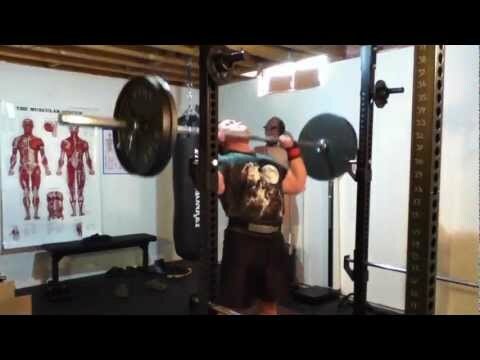 On Friday, I hit a 515 lb low bar squat. First low bar squat PR since September 29, 2012. That's about 7 months...which is TOO DAMN LONG for a 1RM PR in my opinion. My previous best was 510 lb. I'm pretty happy with how the squat turned out. Depth was good, and form was good too. I'm glad it didn't turn into a squat-morning or anything like that. I'm going to save my squat 1 rep max attempts for June at a powerlifting meet, and hit some rep PR's along the way. Looking at the table, there's a lot of empty boxes. I think I'll fill out the 8 and 10 rep maxes after that powerlifting competition, and work on the 2,3 and 5 rep maxes for now (probably starting with 5RM first). One good thing that I discovered from having an organized table of PRs is that when I look at them, I'm thinking in my head, "What PR should I break next...??". Makes me look forward to training and possibly breaking a PR. It would be nice if Fitocracy implemented an at-a-glace PR table like this! I've also included this table under "Credentials" in the "About John Phung" author bio box that's at the bottom of every post. I think the result of one's training are just as important as other common "credentials" in the fitness industry (and among e-fitness gurus on the interwebz). I've been wanting this for a while now. Pretty happy I got the LMAO2PLATE OHP for 5 reps milestone! Maybe I'll try for a 260 lb 1RM soon. On the first set, I slipped on the bench despite having that rubber anti-slip mat. Maybe it had something to do with the shirt I was wearing. On the second set, I got 2 reps, but missed on the third. Had I not slipped on the first set, or had I wore my Three Wolf Moon shirt, I probably would have gotten 3 reps. Thinking of going for a 1RM of 380 lb this upcoming Friday. Lately I'm starting to notice from reading other people's blogs and updates in my Facebook feed is that a lot of people who consistently get stronger, along with those who are freakishly strong, tend to keep track and try to beat their personal records (PR's) on a variety of rep ranges and exercises. I think there's something to this, as far as training effect, getting stronger and motivation goes. I mean, if someone were to improve on their 5 rep max on say, the bench press, then their 3 rep max may be higher as well. And if this someone hit a 3 rep max, then they might be in a position to set a new 2 rep max. If they set a new 2 rep max, then maybe they're strong enough to get a new 1 rep max. Going by memory, this has been the case for me. If I hit a rep PR, then I usually can get another PR in a different rep range, and sometimes even a new 1 rep max. Motivation-wise, having a 5,3,2, and 1 rep maxes on all major lifts gives you a lot more to shoot for (ie. more PR's to break). Trying to break a 1RM on the squat, deadlift, bench press and overhead press (total of 4 personal records) won't last very long and is not sustainable. But if you go keep track of your 5RM, 3RM, 2RM and 1RM on the big 4 lifts (at least, the 4 big lifts that I do), that's a total of 16 different PR's to try to break. Choosing from 16 different personal records to try to break, say, on a weekly and bi-weekly basis seems a lot more feasible than simply going for 1 rep maxes. And that's only with 4 rep ranges and 4 different lifts. 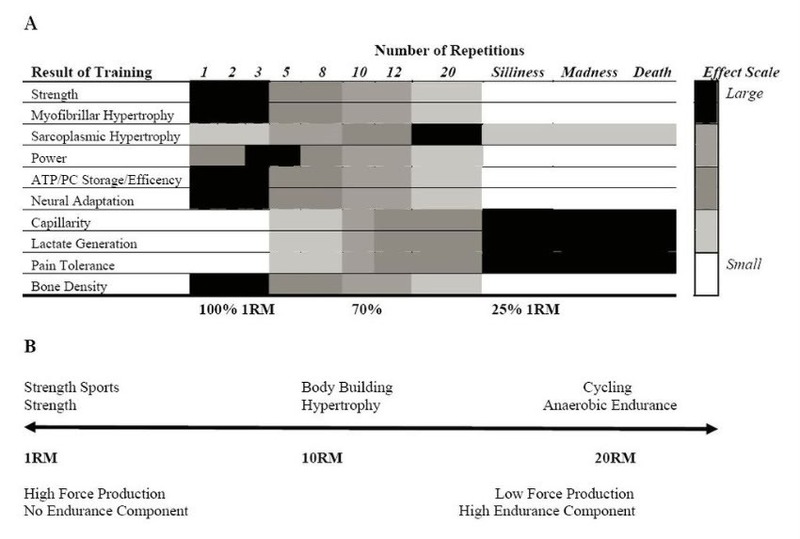 The number of PR's "to break" would increase with different rep ranges (say by adding 10RM, 8RM and so on) and different exercise or a variation of an exercise (ex. paused squats, paused bench etc), giving you more opportunities to break PR's and get stronger on a regular basis. I don't know about you, but whenever I hit a PR in any rep range, I feel good about myself, and it validates that my training is working. Whenever I'm planning to hit a PR, it's usually on my mind days before I attempt it, and I'm pretty psyched for my workout. At this point, I'm keeping track of my 1RM (it's on the "About The Author" section of each post on my blog), but I need to add 2,3 and 5 rep maxes (maybe others) to that section, or maybe new page so I can easily look it up.